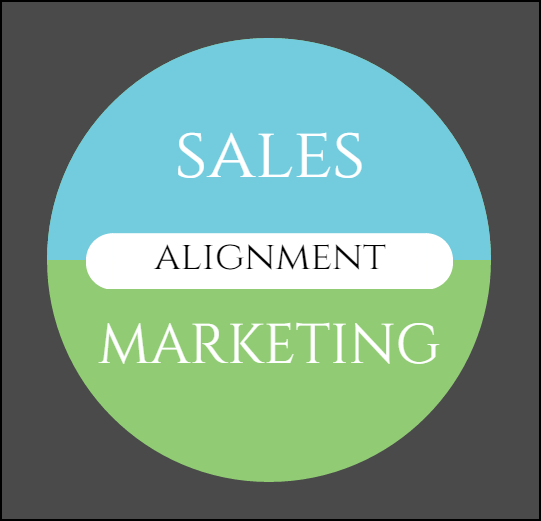 After writing hundreds of MarketingSherpa Newsletter case studies and, in the process, interviewing, speaking with and getting to know many, many marketers, one attribute really stands out for influencing successful marketing — Sales and Marketing alignment. It doesn’t guarantee success and lack of alignment doesn’t automatically mean failure. However, when Marketing and Sales are working together as a team instead of as adversaries within a company, the entire sales pipeline is much more effective. One reason for this success is that companies with a Sales and Marketing alignment are much more likely to see the entire customer experience holistically, where each person is seen in terms of where they are in the process. For example, that person will be seen as a freshly generated lead, a prospect who has been handed off to Sales, a paying customer requiring service or an ongoing nurturing to ensure they remain a customer. This is much more preferable than being just a cog in a process that begins with Marketing, goes to Sales — where, at that point, the person drops off of Marketing’s radar altogether — and then, hopefully, is passed to customer service and is no longer a Sales concern. Email Marketing: What are some of the biggest deliverability challenges? 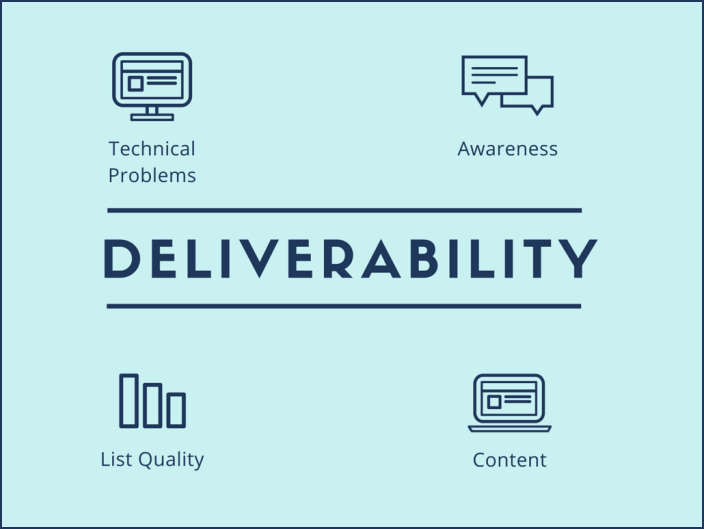 Deliverability should be a concern for any email marketer. If you can’t get into the inbox, your email send might as well not have even happened. Deliverability can be a challenge. A bad reputation score can significantly impact your ability to reach the inbox. An ESP (email service provider) with other clients behaving poorly on a shared IP also hurts you. Getting off of a spam or junk mail blacklist can be a Kafka-esque experience of not really being sure who or what will get you off that list. To help you with deliverability issues, I reached out to three industry experts to find out what they considered to be the biggest deliverability challenges facing marketers today. He said understanding the data behind your email program is going to do more towards solving a deliverability issue than following any list of tips or best practices. Customer reviews and testimonials can be a powerful source of third-party validation and credibility when added to an overall content marketing strategy. Today’s MarketingSherpa Blog post looks at how one consumer marketer — in a business area that is potentially hostile to positive customer feedback — initiated a campaign to actively add customer reviews to its marketing mix. 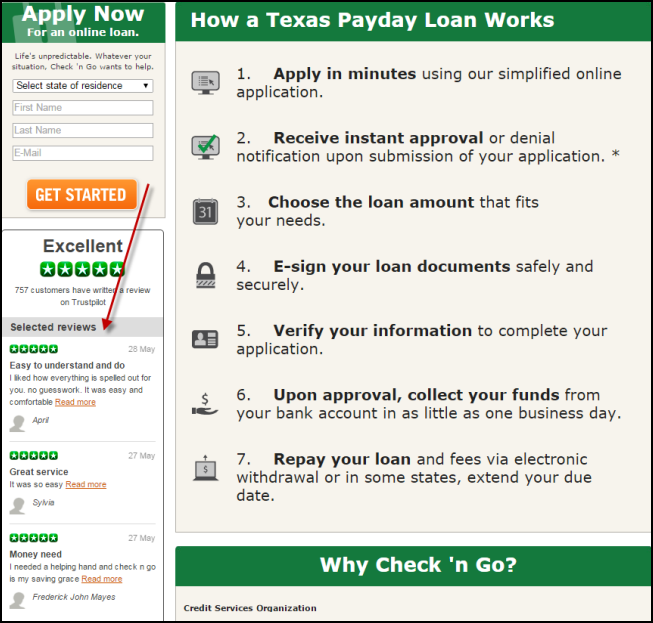 Check ‘n Go is a payday loan company with a focus on short-term consumer lending with retail outlets going back almost 20 years and, more recently, an online option for loans as well. 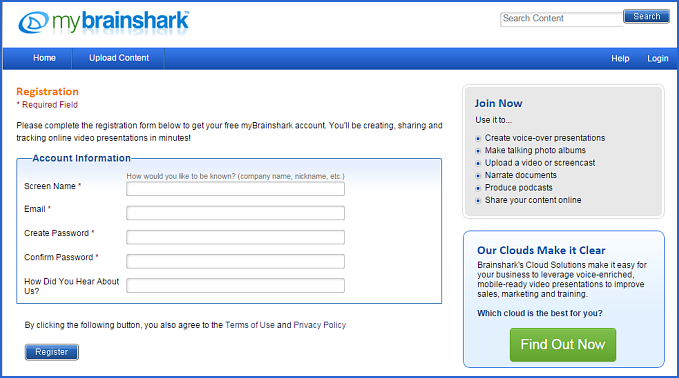 Farhad Rahbardar, Web Analytics Analyst, Check ‘n Go, worked with the company’s Analytics and Customer Acquisition Group. Rahbardar said the team wanted to begin using customer reviews in different touchpoints on the website. The team also wanted to aggregate those reviews through an independent third party to help build Check ‘n Go’s Google Seller ratings. The team pressed on, chose a customer review vendor and implemented a process for collecting customer reviews. After someone secures a loan, they receive messaging that simply asks them to come back to Check ‘n Go and write about their experience. The first place Check ‘n Go began using these reviews was on its landing pages, and the team even tested different ways to display the reviews. 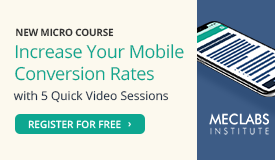 Today’s MarketingSherpa Blog post features an excerpt from a MarketingSherpa Optimization Summit 2014 presentation — “Mobile Optimization: How a B2B ecommerce company used responsive design to increase revenue by 180%” — with David Ciccarelli, Chief Executive Officer, Voices.com, providing insights into how the company utilized its customers in a mobile marketing campaign on responsive design. In this video David explains how Voices.com tested its website with click tracking and heatmaps, saying that the first goal was to find out what website elements the team needed to keep when rolling out a new, responsive version that would be effective on both desktops and mobile devices. “That’s how we identified the [website] elements that we were going to keep,” he says. 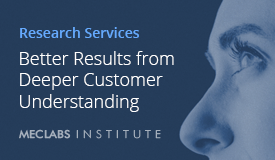 Another aspect of taking a customer-centric approach was that the team made a change in how interaction with the website was explained in help guides, tips and tutorials, email instruction and FAQs. This was done in order to reflect that mobile users will be tapping, spreading and pinching rather than navigating with mouse clicks like desktop users. One of my recent MarketingSherpa Blog posts, “Content Marketing 101: Tips on content strategy” covered some basics of content marketing. 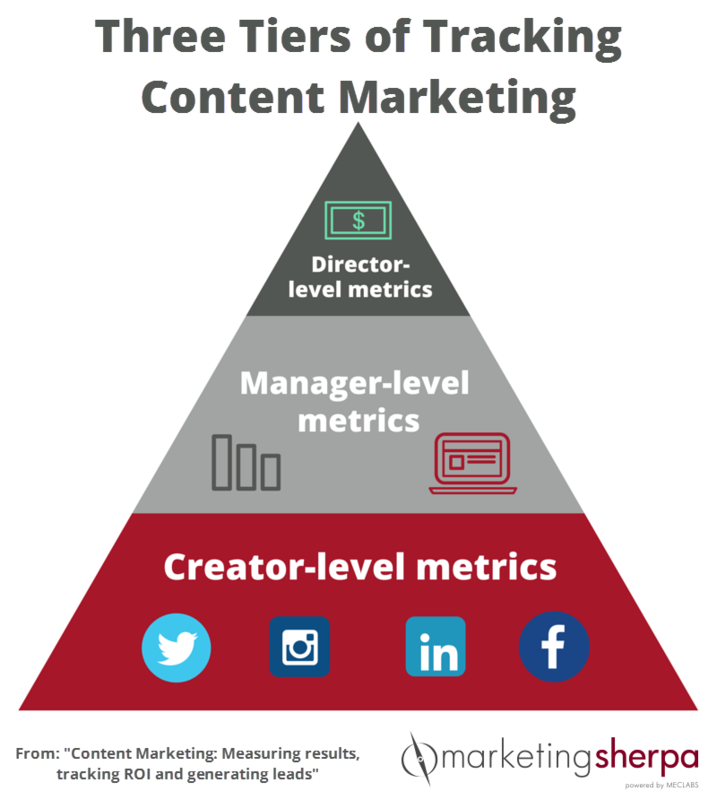 For today’s post, I want to dig into the MarketingSherpa Newsletter archive to highlight what can be a challenging aspect of content marketing — quantifying and proving its worth. The first article to highlight is a how-to, titled “Measuring Content Marketing: How to measure results, find gaps and grab opportunities,” that covers a range of tactics offered by Joe Pulizzi, Founder, Content Marketing Institute, and Michal Brenner, Senior Director, Global Integrated Marketing, SAP, on quantifying your content marketing efforts. Joe says to set three categories of goals for content — driving sales, saving money and making customers happier. For a company blog, these KPIs include traffic metrics, such as page views and unique visitors; source metrics, such as inbound search results and referring sites; and sharing metrics, such as tweets. 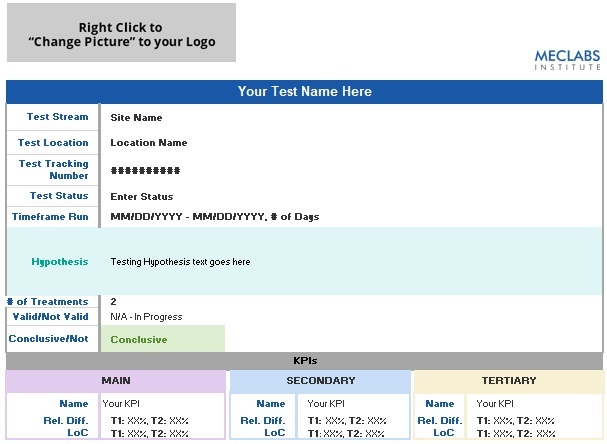 These KPIs include lead volume generated, lead quality, cost-per-lead and conversion rate. At the highest level, content KPIs include revCreatienue, costs, ROI and customer lifetime value. Analytics also plays a role in content marketing. Michael suggests that Google Analytics can be a content marketer’s best friend because the free tool allows tracking of the most downloaded, shared and viewed content on the website, sources of inbound traffic and organic search keywords used to reach your site. 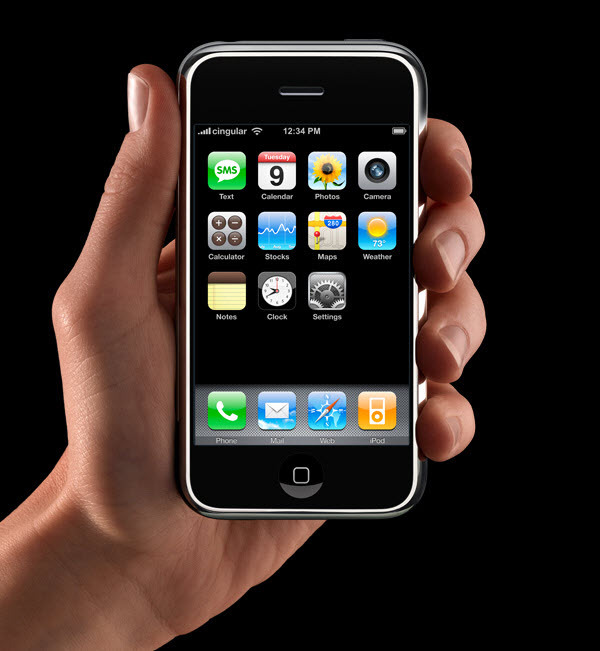 Omni-channel Marketing: How do you define the term? One of the latest buzzwords out there is “omni-channel marketing” — a term that obviously is related, but different from multi-channel marketing. However, like any new term or phrase that begins receiving a lot of traction, there is no clear definition on exactly what omni-channel marketing means or entails. With that in mind, I reached out to a group of marketing industry thought leaders who, by job title and description, are tasked with staying in front of industry trends. “Omni-channel to me means that, first, a brand or company understands that its customers interact with them in multiple and different channels along their customer journey and is organized around that customer experience and journey, rather than individual channels. Then from an execution perspective, it means listening to and capturing data and behavior from a customer across all channels and then responding back through the channel, or channels, that best moves that individual customer on to the next stage of the journey. 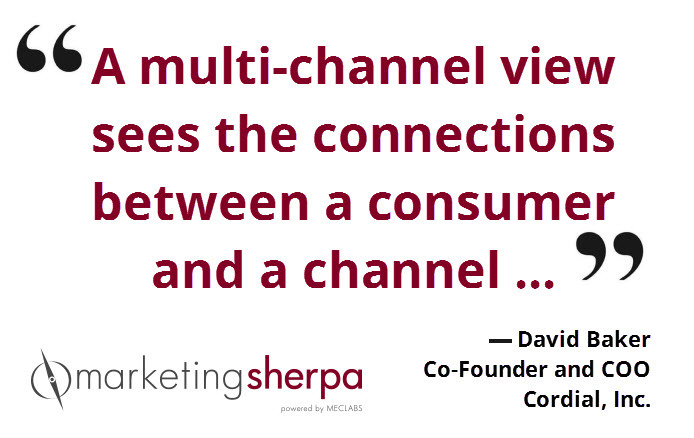 David Baker, Co-Founder and Chief Operating Officer, Cordial, Inc.
“The fundamental shift in multi-channel vs. omni-channel thinking is a product of a maturing view of the consumer by marketers. Think consumer at the center, wrapped by a connected experience vs. the consumer connecting with each channel discretely in a very linear way. 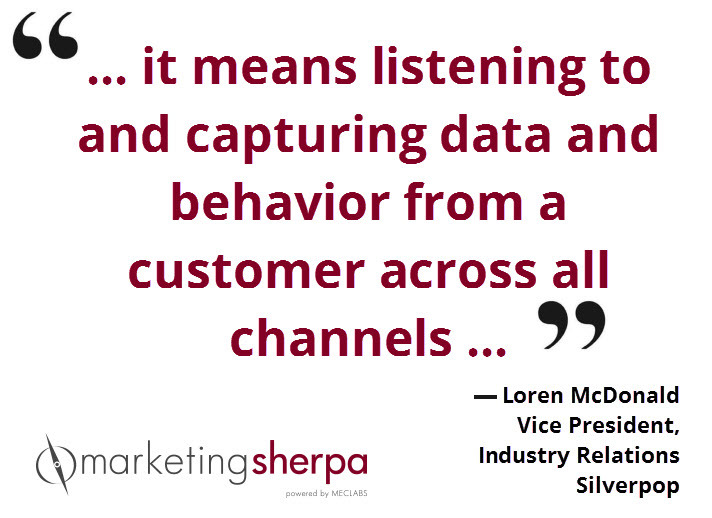 By this point, I think most marketers understand the value and importance of the content marketing channel. It’s well known that prospects for both consumer and B2B marketers are now doing most research on their own — I’ve seen research reporting B2B prospects are now getting 80% down the pipeline before ever raising their hand and letting you know they might be a customer. A prospect 80% down the pipeline is likely going to be a more qualified prospect because they are nearing the end goal in terms of making a purchase — and because Marketing and Sales only have to get that last 20% to close the sale. At the same time, it means you can’t just push out marketing messages to names and leads in order to reach the entire marketplace. The solution to this issue is to have a solid content marketing strategy in place, maybe even making content marketing the centerpiece of the overall marketing strategy. Having spoken with hundreds of marketers about their content strategies over the years, I wanted to share tips on some of the basics of content marketing with the MarketingSherpa Blog reader. One point about content marketing that can’t be emphasized enough is this: It’s not about selling your company, your products or your services. At its core, a content marketing strategy is targeting those prospects in the research phase that have yet to identify themselves as potential customers. You don’t know their names; you don’t have their email addresses in your database, and they might not even follow you on social media. However, they are conducting research on your products, your services, your marketplace, your competitors and your company. If you can become a resource of basic information and instruction around the general marketplace of your business, you can become a trusted destination for those as-yet unknown prospects. The two terms to keep in mind here are thought leadership and brand awareness. If you can provide valuable and relevant content to people conducting research on your marketplace, products and services, you can become a thought leader for information in that space. As people visit, and revisit, your website and other digital outposts (such as a Facebook page or answer to a question on Quora) without being sold to, they will become aware of your brand. When they do decide to take a more definite step and raise their hand to be sold to, hopefully you will be top of mind.